I live alone, with my cat and dog. Sometimes we are bored because nothing happens in our town. But the Virgin of the Rosary made us the miracle. 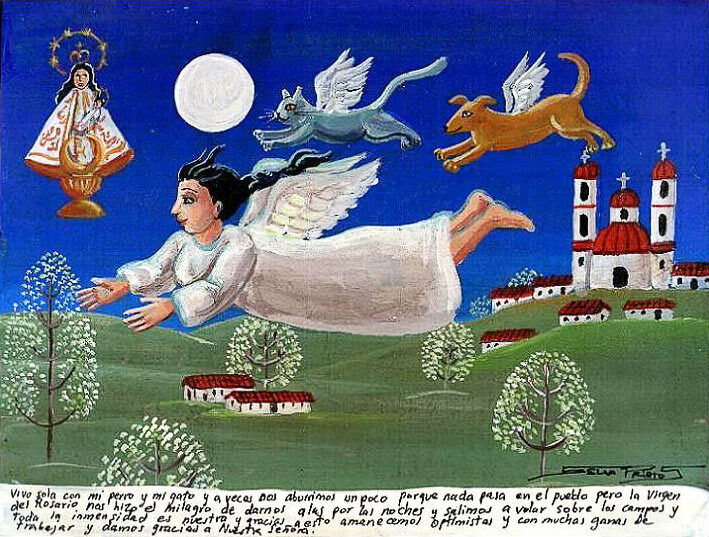 She gives us wings at night, and we go to fly over the fields, and the immensity around is ours. 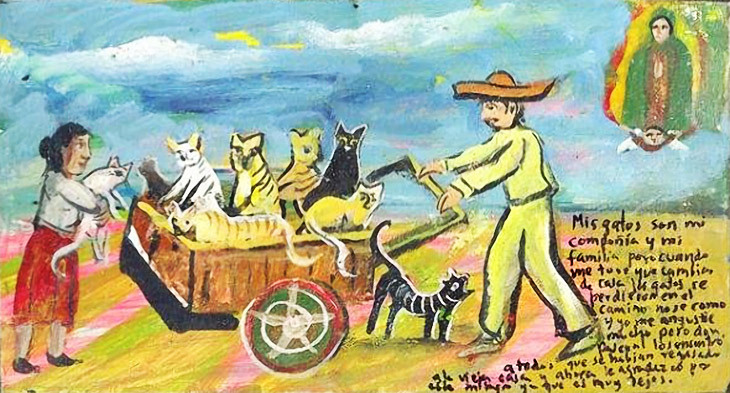 Thanks to that we manage to remain optimists and keep great wish to work. We thank the Holy Virgin. 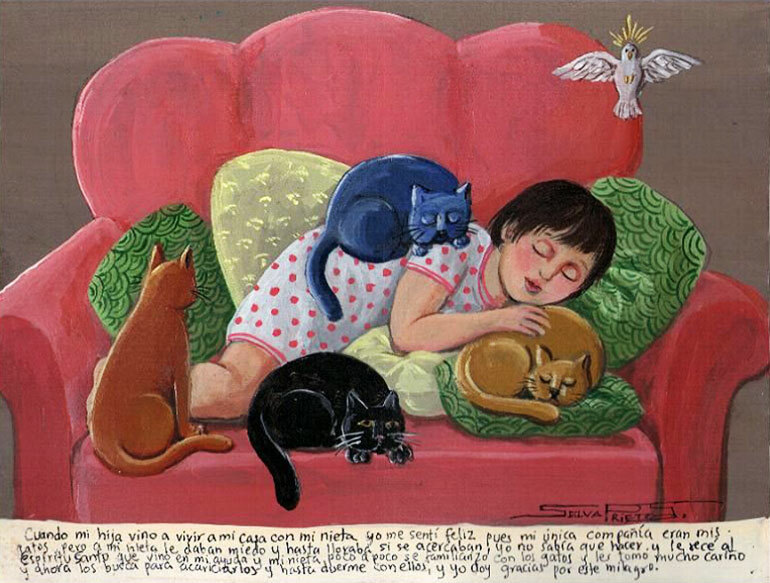 My cats are my family and my friends. When I was moving in another house, they got lost on the way there. I don’t know how it happened. I was disconsolate. 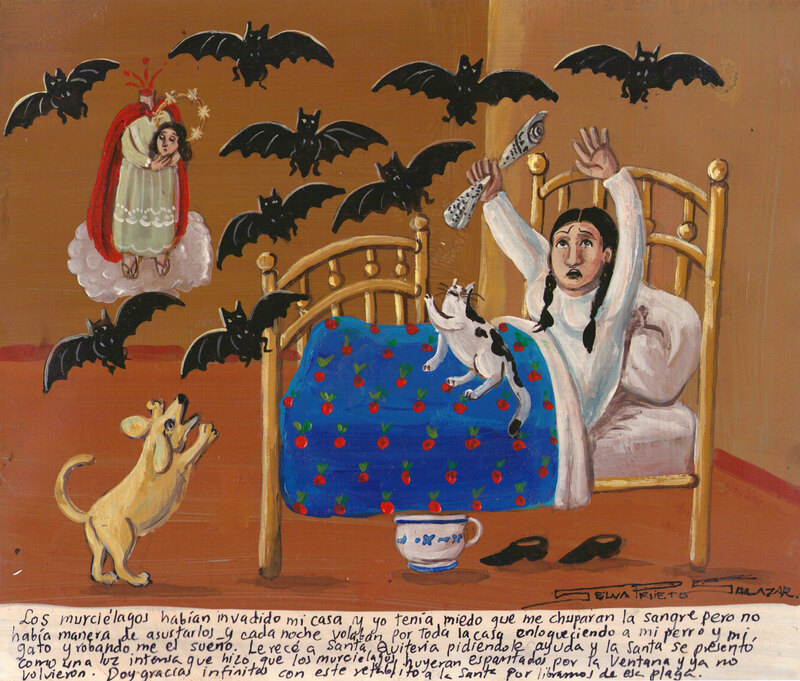 But don Pascual found them all, because they came back to the old house. I thank for that miracle because my old house was pretty far away. After many years of marriage my wife’s character changed. 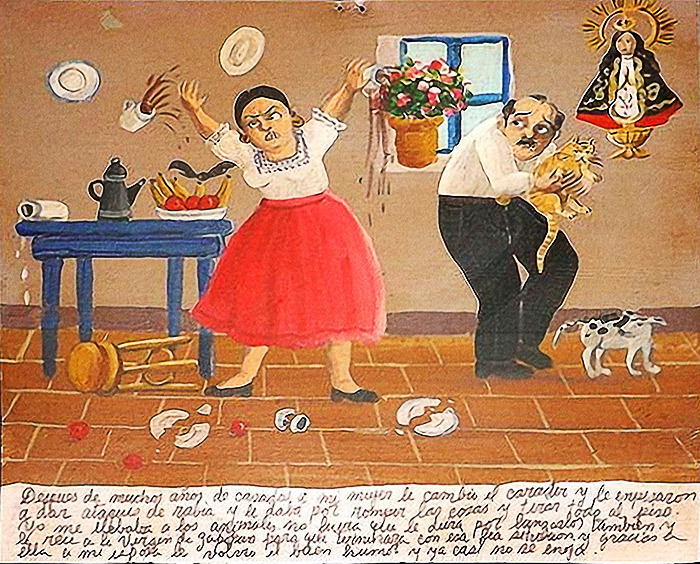 She had rage attacks in which she was throwing and braking everything she had around her. 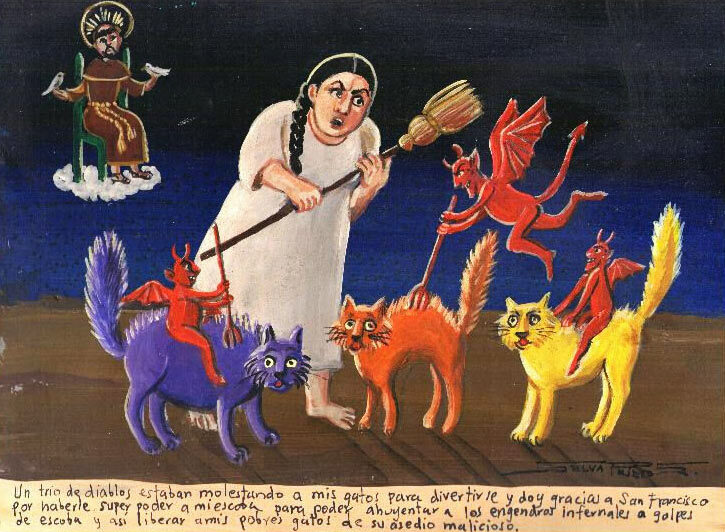 I took the animals so she wouldn’t throw them and prayed the Virgin of Zapopan to stop this nightmare. Thanks to the Virgin my wife came back to her good mood, and now she’s almost never angry. The neighbor cat came to sit at the wall fence with her kittens. My daughter took a chair and climbed the wall to play with them. 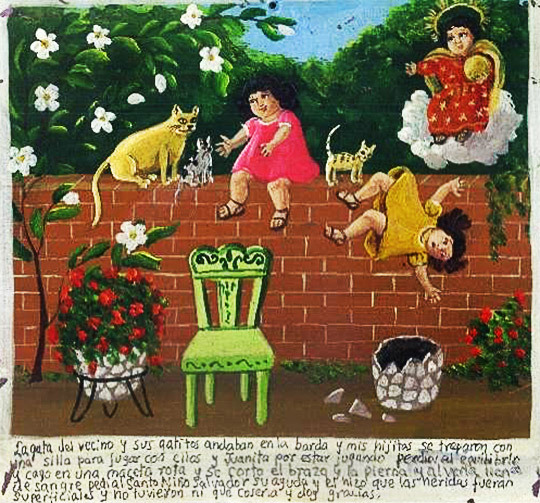 While playing, Juanita lost her equilibrium and fell on the broken pot. She cut her arm and leg. Seeing her all in blood, I prayed the Holy Child the Savior for help. Thanks to him the cuts weren’t so deep so there was no need for stitches. I became a widow in a young age. I had no children and didn’t want to marry again. I got me a good company of my cats instead. 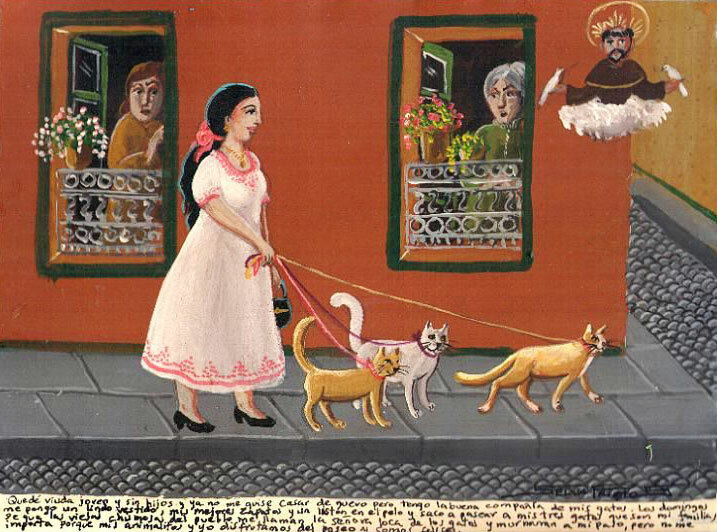 On Sundays I put on a nice dress, my best shoes and a ribbon in my hair, then I take my three cats for a walk. They are my family. 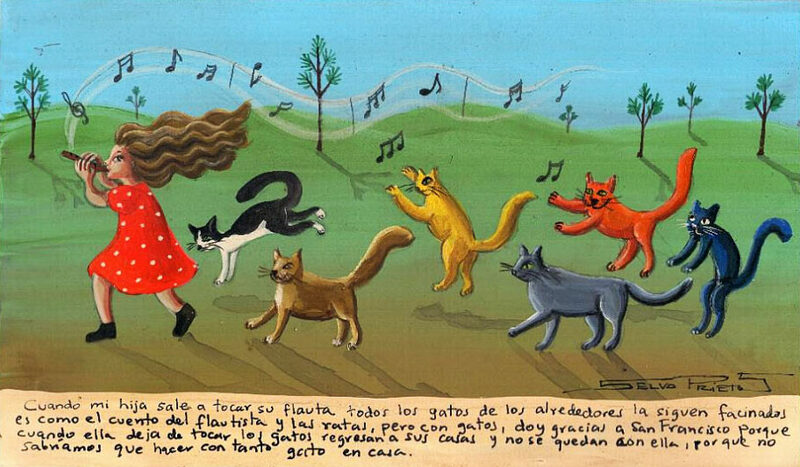 The old gossips of the town call me a crazy cat lady and talk behind my back. But I don’t care because my pets and I enjoy our walk and we are happy. I thank God for brining me a very cute kitten on a cold night. It’s been 12 years with him. One day I bought a very strange plant at a garage sale. The plant grew very fast, and I noticed there were less flies in my house since I’d got it. I thought it was the plant’s odor that scared them off. 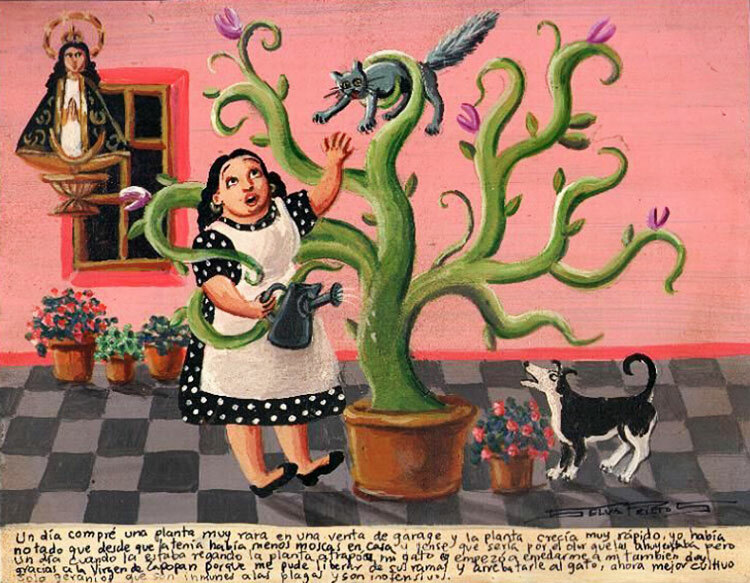 But one day I was watering the plant, and it suddenly grabbed my cat. It even started to tangle me up. 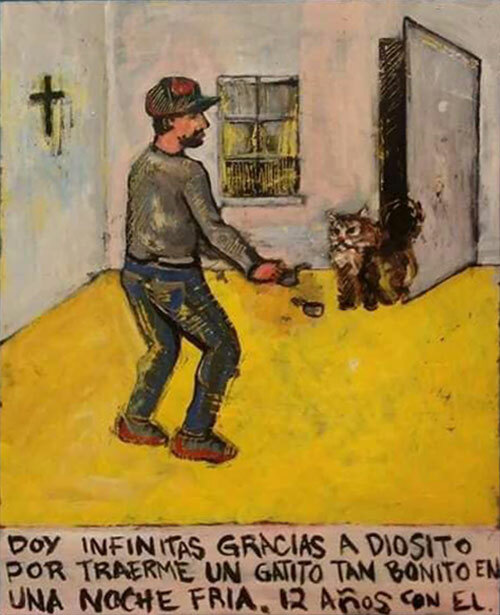 I thank the Virgin of Zapopan because I was able to get free from the sprouts and to liberate my cat as well. I’d better plant just geraniums. They are harmless and immune to pests. 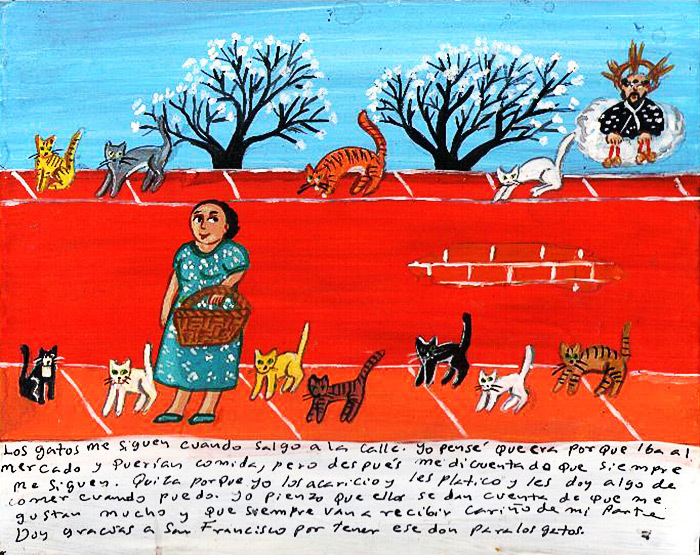 Two thieves got into doña Genoveva’s house but her cats defended her to the death. 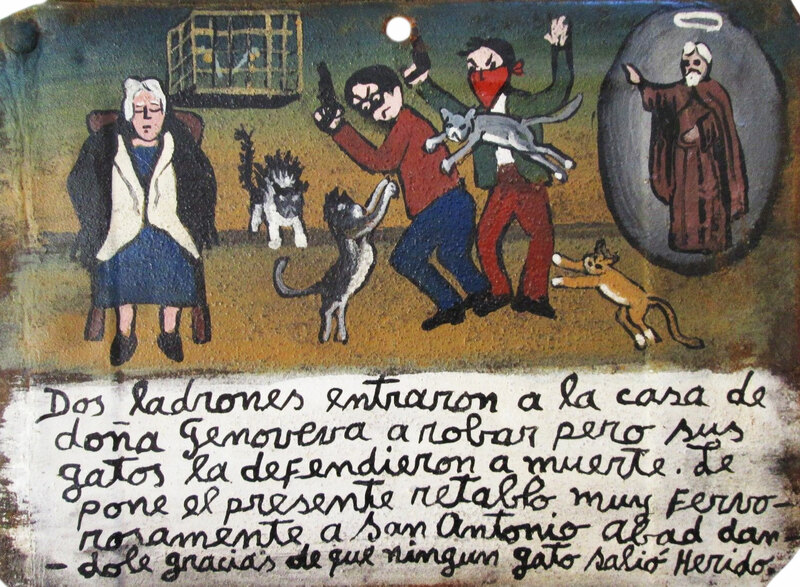 She brings the present retablo to Saint Anthony the Great thanking him for no cat got hurt.